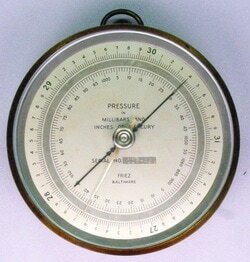 This 1942 Friez ship's barometer was used by the US Navy according to the party I bought it from, presumably in WWII. It has scales in inHg and millibars, with a measurement range of 26 to 31 in Hg. The dial is about 4.5 inches in diameter.